Who was the man in the feathers behind the Black Keys? Adding some gale force rock action to a Grammy Awards ceremony otherwise ruled by pop, hip hop and R&B, Akron, Ohio’s Black Keys plugged in and kicked out their blues-inflected jam “Lonely Boy.” They were flanked by the Preservation Hall Jazz Band, but it was a curiously dressed gentleman on keyboards who might have left younger viewers scratching their heads. Resplendent in the feathery finery of his native New Orleans’ rich cultural history, pianist Dr. John came dressed early for Fat Tuesday (which is Feb. 12), lending some authentic Big Easy R&B flavor and voodoo boogie to the Black Keys’ stripped down garage rock. While he may have looked slightly out of place alongside the sharply dressed pop cognoscenti on the Grammy stage, Dr. John’s a music veteran who’s been active since the 1950s, renowned for his heady, Creole-inflected mix of rock, jazz, blues and psychedelia. 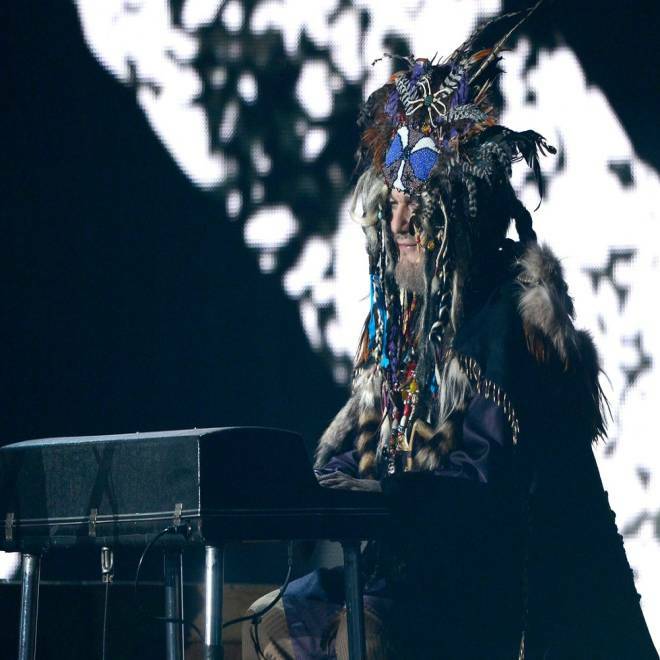 Dr. John’s most recent album, last year’s Locked Down (produced by the Black Keys’ Dan Auerbach), finds the storied musician sporting the very same headdress he sported onstage Sunday night.